Key difference: The unique aspect of Lenovo IdeaPad Yoga 13 is that it is a convertible laptop with multi-mode 360 deg Flip design. This allows the device to take up four design modes. This includes Laptop Mode, Tablet Mode, Tent Mode and finally, Stand Mode. The Lenovo IdeaPad Yoga 13 features a 13.3 inch HD+IPS capacitive multitouch display and weighs 1.54 kg (3.4 lbs). It is available in various models, powered either by 3rd generation Intel Core i7/ i5 / i3. The models would come with either a 4 GB DDR3 RAM or 8 GB. Sony has recently announced its revamped smartphone and tablets line. 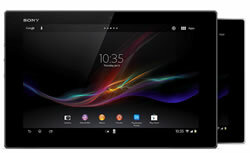 Along with the new flagship phone Sony Xperia Z, the company has also added a new tablet, the Sony Xperia Z Tab. The tablet supports a 10.1 inch TFT capacitive touchscreen and is created using the Sony Mobile BRAVIA Engine 2 technology. 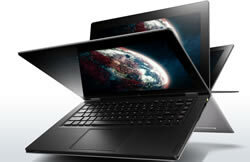 Lenovo IdeaPad Yoga 13 is yet another offering by Lenovo under its IdeaPad series. However, the unique aspect of the device is that it is a convertible laptop with multi-mode 360 deg Flip design. This allows the device to take up four design modes. This includes Laptop Mode, Tablet Mode, Tent Mode and finally, Stand Mode. This is managed by using two double sided hinges. This feature gives the device versatility and allowing the user to use the device as either a laptop or a tablet. Hence, the device is effectively two-in-one, a tablet and a laptop. The Lenovo IdeaPad Yoga 13 features a 13.3 inch HD+IPS capacitive multitouch display and weighs 1.54 kg (3.4 lbs). It is available in various models, powered by 3rd generation Intel Core i7-3537U/ 3rd generation Intel Core i7-3517U/ 3rd generation Intel Core i5-3317U/ 3rd generation Intel Core i3-3217U. The models would come with either a 4 GB DDR3 RAM or 8 GB. The Lenovo IdeaPad Yoga 13 runs on Windows 8 Pro 64 or Windows 8 64 depending on the variant models.